Successfully Added Amazing Touchscreen MP4 with 2.8 Inch LCD and Super Sound (8GB) to your Shopping Cart. 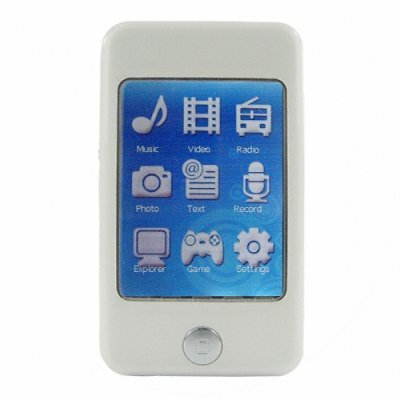 Amazing touchscreen MP4 with 2.8 inch LCD and superior sound quality (8GB model). With portable media players continuously evolving to become even more and more useful, it was only a matter of time before we brought you a new budget friendly large touch screen (2.8") digital media player. This full featured model plays music and videos, has an FM Radio, E-Book reader, and picture viewer! With its crystal clear 320x240 resolution screen and an awesome clean white finish, this baby is a joy to carry around and show off. The top notch color icon menu system is easy to navigate while the audio output includes an incredible equalizer system with 7 presets and an 8th user adjustable setting. The listed price is not a typo, we really offering this hot new portable digital media player for a budget friendly price! In stock now and available for sample or stock orders. Feature it on your EBay, UBid, Amazon or internet storefront to secure some new sales for yourself while using our convenient shipping and no M.O.Q. policy (no minimum order quantity) to make your life simple. I Purchased this touch screen MP4 because my wife has trouble navigating with buttons or joysticks. It is very easy to navigate through the menus as the product description states. It feels and looks very well made and has an excellent screen, and she likes the white case better than the typical black designs. Converted movies and pictures are very sharp and bright on the LCD screen. on 2009-01-25 14:29:59 good product to buy the only thing im pissed off at is how to get the game selection in the mp4.